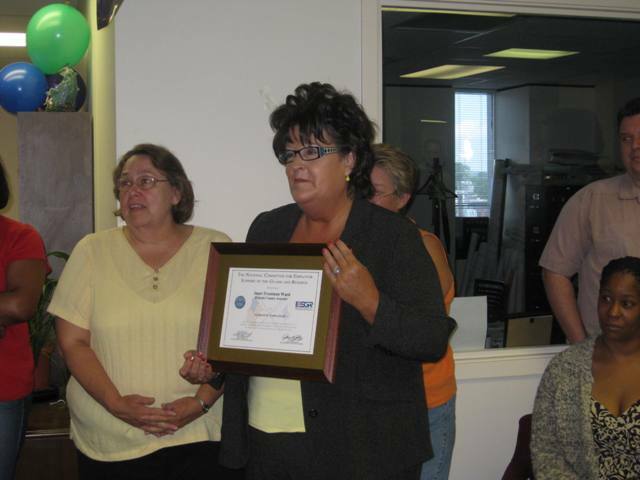 Janet Troutman Ward has been continuously elected your Pulaski County Assessor since November 2000. During this time, the office has and continues to evolve in terms of automation and technology. Mrs. Ward took office with the passage of Amendment 79 and Act 1185 which required cyclical reappraisals and numerous changes to the administration of the property tax system. 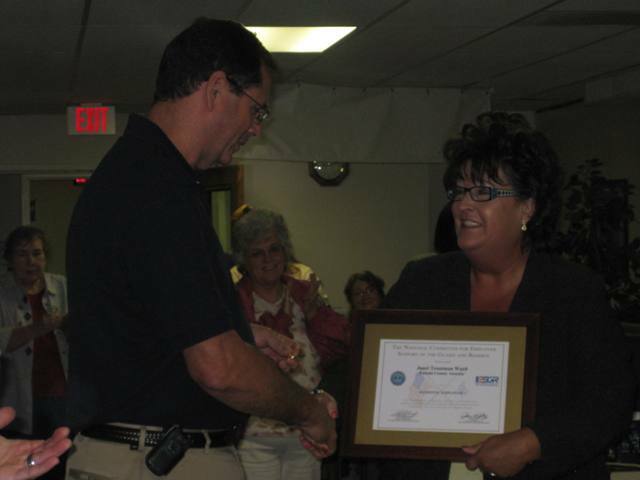 Since that time, Pulaski County has successfully completed four reappraisals using county employees. Through intergovernmental cooperation, Mrs. Ward moved quickly to complete a GIS (Geographic Information System) project. The office makes use of Pictometry, a software which takes aerial photography to new levels and offers benefits to many offices beyond the Assessor’s. The office is currently instituting a document management solution called Docuware. This software is significantly changing the way the office operates with regard to use of natural and human resources. The processing of documents digitally provides accountability, transparency, and flexibility within the office. 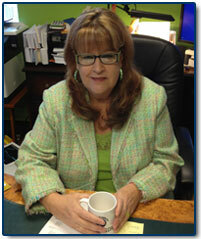 Mrs. Ward began her career with the Pulaski County Assessor’s Office in 1993 as a residential appraiser. A former home builder, her knowledge and experience led to her promotion to Senior Appraiser Analyst and then Chief Deputy before running for the office in 2000. She holds a degree from the Master’s Divinity School. Keenly aware of her leadership role, Mrs. Ward encourages employees to volunteer their time and energies to community organizations such as food pantries, women’s shelters, and other worthy causes. She has been married over 42 years, is a mother and grandmother. 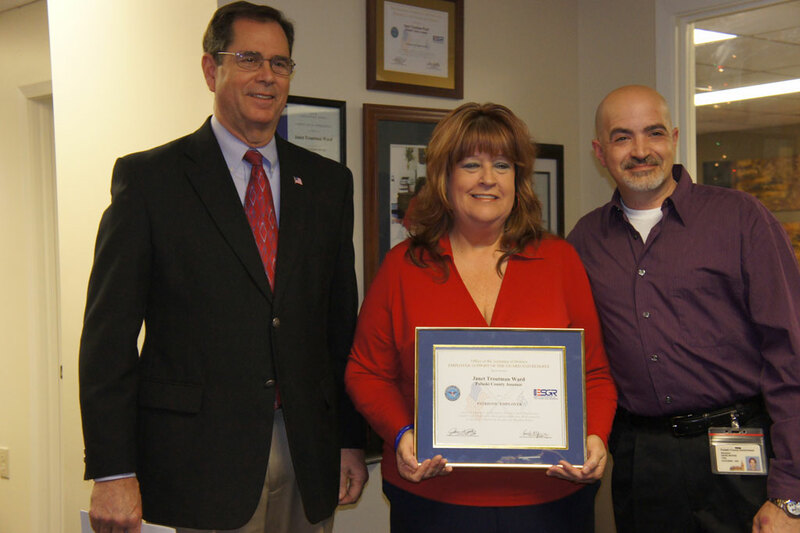 Janet Troutman Ward Receives Patriot Award Again! Little Rock, Arkansas – Arkansas Employer Support of the Guard and Reserve (ESGR), an agency of the Department of Defense, announced today that The Pulaski County Assessor, Janet Troutman Ward will be honored on December 19, 2011 at 10:00 am with a Patriot Award in recognition of extraordinary support of the employees who serve in the Arkansas National Guard and Reserve. 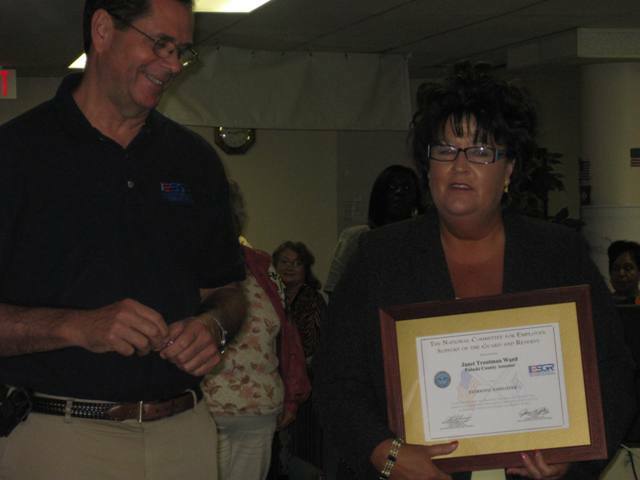 The award will be presented to Ms. Ward at the Pulaski County Assessor’s Office in Little Rock. 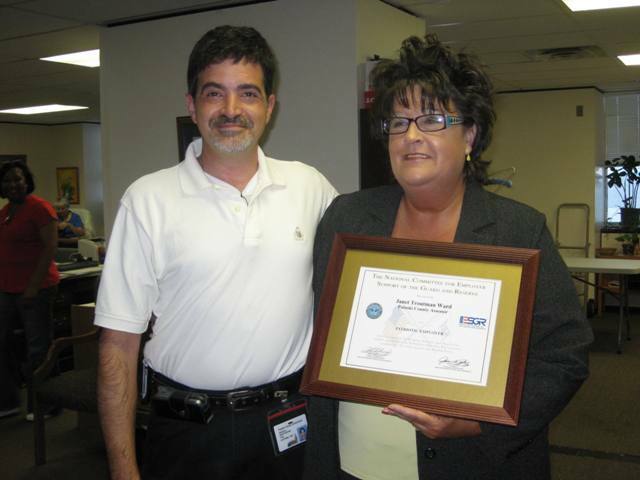 Ms. Ward stated that she was honored to receive the award and that she believed military service is one of the highest forms of public service. “Whenever we can make life a bit easier for those in military service, we do.” Ms. Ward added. As the 1.3 million members of the National Guard and Reserve continue to perform an increasing number of unique missions with America’s borders and beyond, ESGR will continue to be the resource for the employers of citizen warriors. 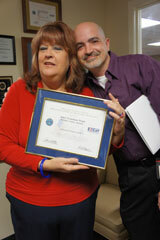 ESGR recognizes outstanding support, increases awareness of the law, and resolves conflict through mediation. More information about ESGR Employer Outreach Programs and volunteer opportunities is available at www.esgr.mil, or by calling Richard Green at 501-212-4096. 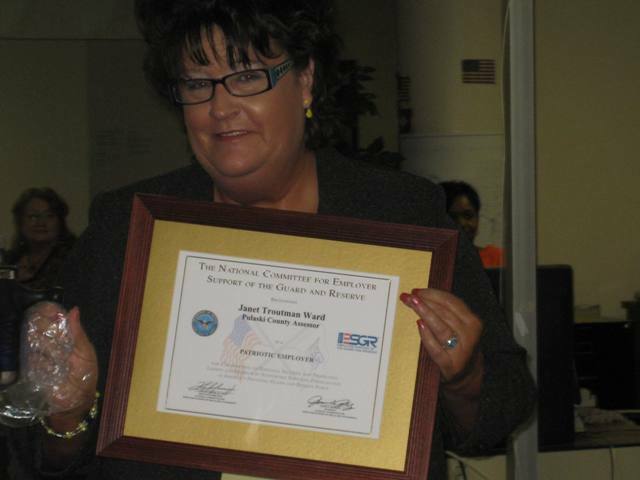 Little Rock, Arkansas – The Arkansas Committee for Employer Support of the Guard and Reserve (ESGR), an agency of the Department of Defense, announced today that Janet Troutman Ward, Pulaski County Assessor was honored with a Patriot Award in recognition of extraordinary support of its employees who serve in the Arkansas National Guard and Reserve. As the 1.3 million members of the National Guard and Reserve continue to perform an increasing number of unique missions with America’s borders and beyond, ESGR will continue to be the resource for the employers of citizen warriors. 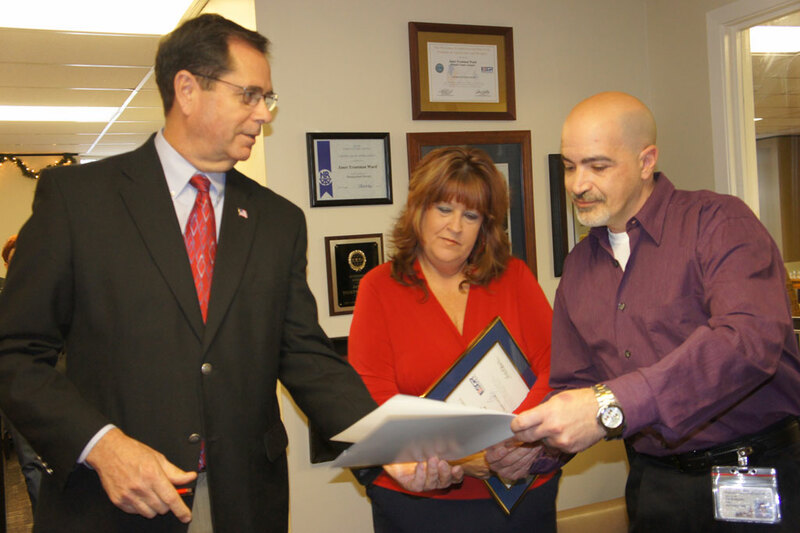 ESGR provides education, consultation, and if necessary mediation for employers of Guard and Reserve employees. More information about ESGR Employer Outreach Programs and volunteer opportunities is available at www.esgr.mil, or by calling 501-212-4096.